Over the past few years, the touted driver shortage has become more than just an industry topic. Non-industry media, such as the Wall Street Journal and Fortune, have started reporting on the issue. Yet these are not earth-shattering revelations. You’ve known this is happening for quite a while, and you’re probably already feeling the pinch. I mean, that’s why you’re reading this article on driver recruiting, right? Now you have to ask yourself a new question: does your recruiting budget accurately reflect your fleet’s needs? To really understand and evaluate your budget, you need to look at your cost of advertising per hire. If you don’t know this, you should. I’ve linked an article here that can help you assess this number. 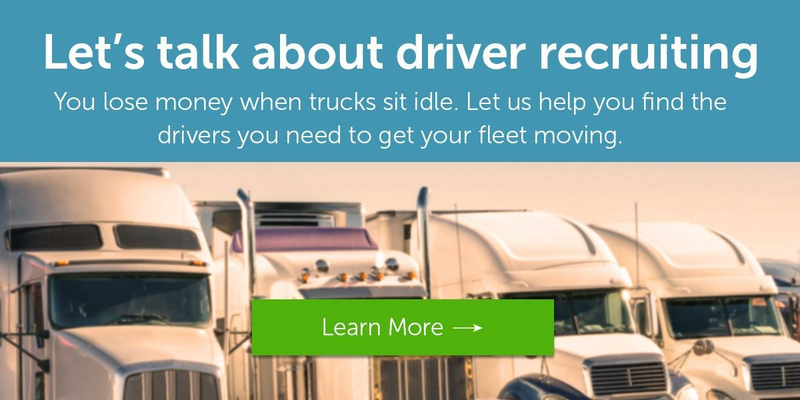 Alongside your cost-per-hire, you should know how many drivers you need. According to the American Trucking Research Institute, both large and small fleets alike have turnover rates above 90%. And the American Trucking Association reports that we currently have a shortfall of 35,000 drivers and a potential shortage over more than 240,000 by 2020. Empty trucks cost money. In fact, our math puts the direct loss in freight revenue at around $500 to $800 a day (depending on the type of freight). With additional indirect costs, i.e. recovery, new driver prep, repairs, and etc, you could actually be looking at closer to $5,000 or more every single day. Once you understand your costs and how many drivers you need, you can ask the real question: does your budget match your recruiting needs? Blog: Job Match Leads: Your Fleet’s Secret Weapon? To illustrate this, I’m going to get a little wonky and use some numbers. We’ll say that your recruiting budget is $80,000. But when you multiply your cost-per-hire and the number of drivers you need, you find that your budget is far below what you need to hit your hiring goals. You’re actually looking at a budget need closer to $145,000. In this case, you’re $65,000 below your projected budget, and you’ll never get the drivers you need. Cost management is an integral part of managing a thriving business, but not like this. For instance, you’re losing $50.00 for every truck that sits idle, and you have 5 trucks sitting idle. Your cost-per-hire is $5.00, but you’re only willing to spend $10.00, meaning you can’t recruit more than 2 drivers. You’re still losing $150 due to freight loss. Are you really willing to lose $150 just to save $15? Of course not, that’s a huge waste. Now imagine this in your actual recruiting numbers. Cost management is great, but only if it’s helping you in the long run. Reducing your driver recruiting budget may seem like a cost management measure, but you end up losing much more than you save. In this case, you’re saving pennies and dimes but losing dollars. Your recruiting budget needs to be realistic. We’re not saying to write a blank check for your advertising. Quite the opposite. What you need is to establish a realistic budget that is most likely to get you the hires your fleet needs to be profitable. Once you’ve set a realistic budget, you can begin optimizing your recruiting to drive down this cost. Find your strengths and determine which applications have the highest return on investment. From there you can build campaigns designed to get this conversion and lower your recruiting costs. Cost management should come through campaign optimization, not unrealistic expectations. Don’t look at it as spending more or less. That’s not the best way to address building a realistic recruiting budget. Instead, look at it like this: spend enough to reach the drivers you need and optimize your spend for the best converting applications.